awesome tutorial! Thanks for writing it. Unfortunately, for my needs, i find the performance of Multipeer to be sub-par. I’ve been using an open source iOS library called CocoaAsyncNetwork in a commercial app called tappr.tv, and I’ve found its performance to be awesome. Similar to Multipeer, it allows any device to both advertising and search for services, then connect as either server, client, or peer and send data back and forth. After optimizing my use of it, I can get 5-6 devices all talking with each other over a local-only WiFi network, with very little latency or discernible visual lag. Its suitable for professional use cases. To me, the promise of Multipeer is that it could do all that CocoaAsyncNetwork can do, PLUS include Bluetooth and without going thru a router. I implemented Multipeer in tappr.tv, and got it working, but there’s significant lang in the delivery of of data. movement on one device is eventually delivered to another device, but often in a stuttering fashion. And in fact, you can see this stuttering effect in your sample app. Is there something we’re missing, or is Multipeer simply not designed for high performance low-latency data sharing? I downloaded the project from https://github.com/mxstrand/iOS_Bluetooth_App and have been running it with Bluetooth only (WIFI turned off) on two iPods. I find even before the alerts appear that only one of the iPods receives a call in session:peer:didChangeState: notifying it that connection has been lost to the other peer. 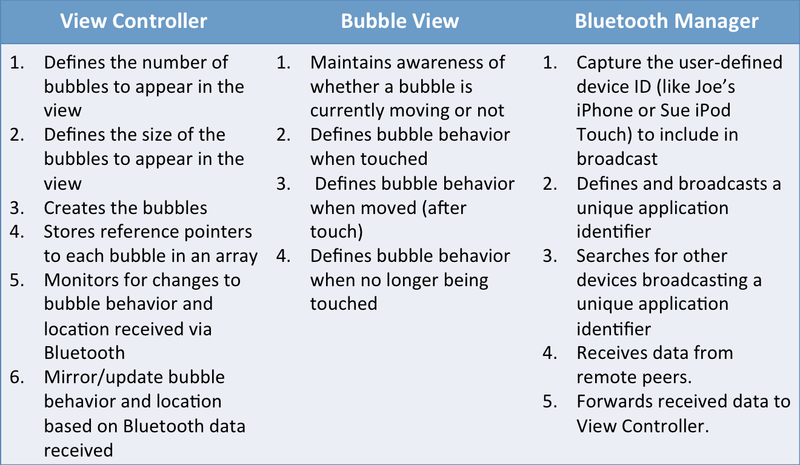 After this event and after pressing OK on both alerts, the peer receiving the call cannot control the bubbles on the other peer; however, the peer NOT losing the connection can still control the bubbles on both iPods. In addition, the peer losing the connection seems to have an earlier timestamp about half the time (and correspondingly a later timestamp about half the time), so I assume the loss of connection is not correlated with the timestamp order. Do you (or anyone else) know why the connection is lost for one peer? I do not see any Multipeer Connectivity framework explicit methods that are called to effect this loss of connection. As an aside, I do not see that the “timestamping” is used in any significant way in the code of the tutorial. Was it just put in to indicate a technique for labeling the peers when there are more than two participating in the multi peer session? Richard – thank you for your comments. I recall the buggy performance you describe and never identified or resolved root cause. Please note the comments from Deeje Cooley above. He published a forked version of the app using CocoaAsyncNetwork and found improved performance.